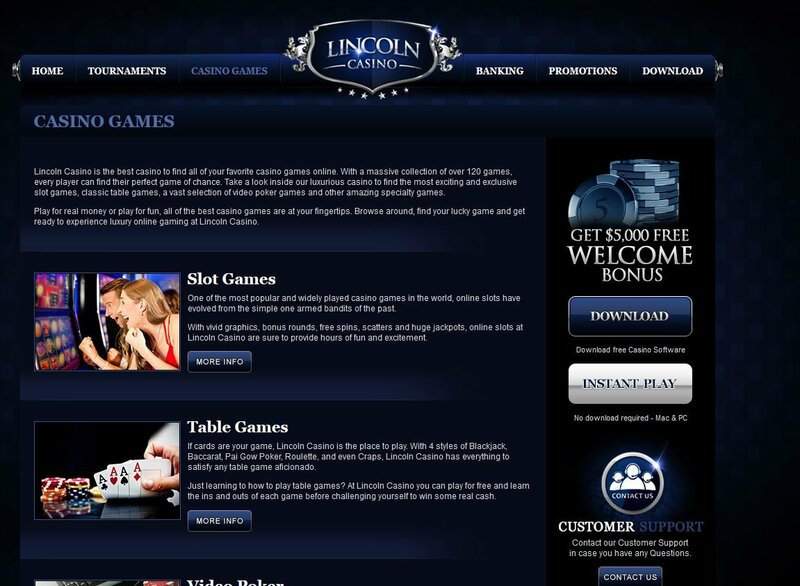 Lincoln Casino is the new sister casino of Liberty Slots and so has the same quality customer service Julian noted in his review of their big sister. Just as I was about to give up on downloading this WGS Technologies powered casino, the elevator music kicked in and I was all downloaded! The log in/sign up screen, also doubling as the lobby was very sleek and welcoming, showing luxury cars and the shining entrance, inviting you in to play. Decked out in a royal navy blue, Lincoln Casino has an air of sophistication and quality about it, like the cars of another era. The lobby lists have been complied by someone with my exact strain of OCD - everything is labelled and filed to perfection - you have your slot games alphabetized under 3, 5 or 7 reel slots and there is a counter in the top left hand corner showing you how high the Lincoln Casino jackpot has risen - it reached a cool quarter of a million dollars while I was playing. Slots are graphically great and there is a lot of money to be made, especially with the nifty auto-play feature. The graphics in general are retro and, while they may have been top notch in the 80's, just like their sister casino, they are somewhat out of place with a 2013 image to maintain. As an American casino, the voices are male American and, I must say, they sounded quite un-thrilled to be playing blackjack with me. The music automatically stops when not using the lobby or playing a game, which I do love but, there is no air of excitement with the drab elevator sounds. Going down anyone? Slots are more optimistically cheerful and, there is a range on offer, though Lincoln Casino seems to be more of a place to play tournaments and benefit from a number of progressive jackpot slots rather than a cutting edge slot play machine. Slot music is tinny and definitely stuck in the eighties! Decked out in a royal navy blue, Lincoln Casino has an air of sophistication and quality about it, like the cars of another era. 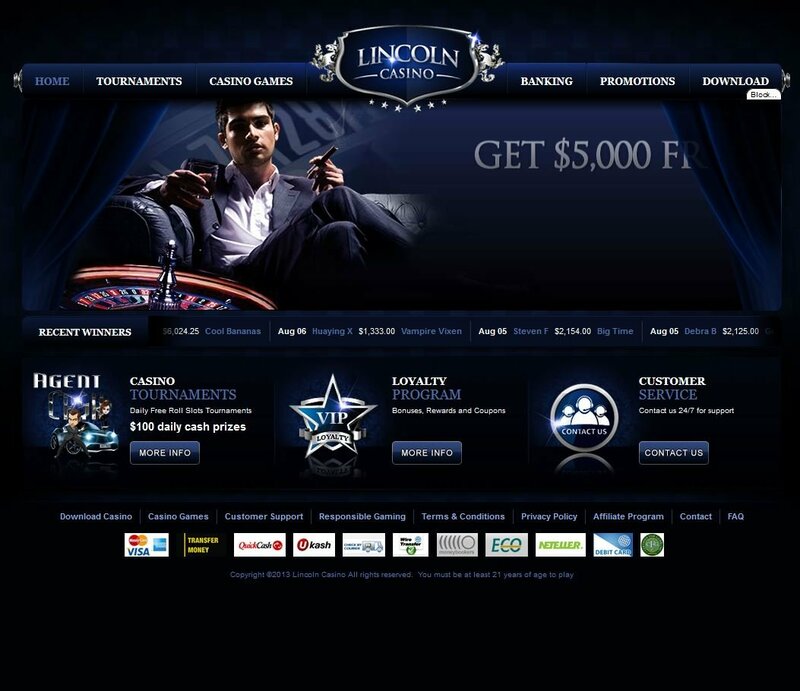 Lincoln Casino greets you with a whopping $5,000 welcome package. That’s up to a grand on each of your first five deposits. 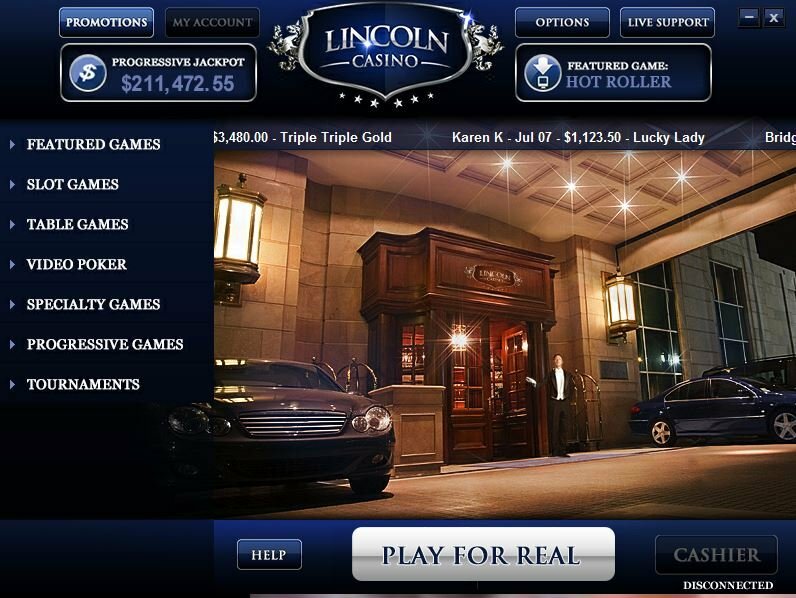 You can get Lincoln Casino rewards, which is like a tiered version of their Comp Points. Lincoln Casino promotions also treat you to coupons for the month of July, very American indeed! One worrying thing is the lack of licensing information, especially since this is a free for all (Americans too) casino. They have all the FAQ's accept all the right payment methods and tell you in detail about their rules but, there is no governing regulatory body information to be found. They are audited by a third party PhD who provides gaming audits and analytical services on a monthly basis to ensure game results conform within accepted norms. Lincoln Casino acknowledges its commitment to fairness with a "Certified Fair Gambling Seal" I hereby certify this review with "Mollie's Certified Opinion Seal." Can you cash out the welcome bonus before the first five deposits?